Paducah is home to the National Quilt Museum and I'd been hoping to manage a trip there. As luck would have it, some of our friends had gone the day before and even the men enjoyed it. (I know that sounds a bit sexist, but...) Anyway, Joe and Neil agreed to go and we were all blown away by what we saw there. Most of the exhibits are modern quilts - from 1980 on. What you would consider traditional quilt patterns are rarely seen. The exhibit that just astounded all of us, though, was the one of hand carved, wooden quilts. They looked so real, you needed to touch them to be sure. The artist also carved clothing items. There was a leather bomber jacket that was just incredible! That evening a group of us went to "the" restaurant in nearby Grand Rivers. Patti's - home of the 2" thick pork chop. It was good to catch up with friends that we hadn't seen for a while and the food was good and plentiful too! We all went home with boxes. The next day Carolyn Ann was pulled out of the water on a travel lift so the bottom and props could be checked out. Everything looked good except for a little play on the shaft. With the help of Dave (TBBG), Joe shimmed it so it should get us home just fine. We'd planned to leave the next day after making another supply run, but it was raining and thundering here and there so we put off the departure for a day. The marina was getting quiet as most of the other loopers had continued on their way. We finally left the marina and went the length of Lake Barkley to follow the Cumberland River, heading for Nashville. It was a quiet day, overcast and pleasant scenery. We have a small cruising guide to alert us to the sights along the way. We couldn't see any fence or concertina wire, but we passed the Kentucky State Penitentiary - dubbed the Castle on the Cumberland. Most of it was built in 1888 and it is Kentucky's only maximum security prison. The real claim to fame is that on Friday, July 13, 1928 seven men were executed there. The record still stands as the most legal executions in one day in the US. Our next stop was a free dock at Clarksville, TN. It's a cute little town with surprising sculptures and fountains and a museum housed in an old Post Office and Customs House building that was built in 1898. I spent an afternoon walking around the rather hilly town while Joe stayed at the boat resting his foot and fighting off the river debris. We made it to Nashville the next day and docked right downtown. Our friends Mike and Linda Borum, who own a Great Harbour N47, live in Nashville and gave us the grand tour. The world's only reproduction of the Parthenon, including a huge statue of Athena, was an interesting stop, as well as the Frist Gallery. We ate a dinner at Bar-B-Cutie and had lunch at a "meat and three" - a term we'd never heard before. We'd looked at the schedule for the Grand Ole Opry and not been too excited - Joe and I know little about country music and its stars. 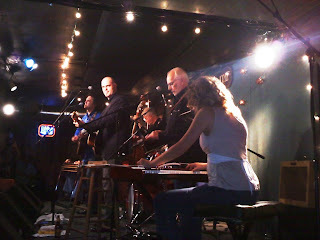 Instead, Mike and Linda took us to the Station Inn. It's not right downtown with the "famous" places and does not look inviting from the outside, but the music was great. On Friday night we saw Peter Cooper and Eric Brace along with a group that included Lloyd Green (steel guitar) and Mike Auldridge (resophonic guitar or Dobro). The next day as we were leaving the Frist Gallery - which is housed in a beautiful old post office building that was almost destroyed - Mike recognized Eric Brace as he passed by. Conversations ensued and as it turned out Eric was from DC and he and Joe knew some of the same places and artists from years ago. He recommended that we go back to see the Monday night show, the Time Jumpers. We did. The Time Jumpers are billed as country-western swing. It's a large group mostly made up of session musicians - some of the best. As schedules interfere, different musicians sit in with them. The musicians' names meant nothing to us, but we sure did like their playing! In the group the night we were there, one fiddler (Joe Spivey) had been nominated for "fiddler of the year," another (Aubrey Haynie) had won it; a singer-guitarist-yodeler (Ranger Doug - also with Riders in the Sky) had won three Grammy's; another (Paul Franklin) had won "steel guitarist of the year" multiple years; Andy Reiss on electric guitar has played on Grammy winning recordings. All in all, we had a great weekend in Nashville thanks to Mike and Linda - you guys are great! On our way to Nashville and after we arrived, it rained off and on. After a night of heavy rain, we awoke to a river that had risen six feet and was running with a debris laden current of about five miles per hour. The river conditions kept some boaters from making the trip to Nashville, and kept others in Nashville a day or two more than planned. By the time we left on Tuesday, the amount of debris and speed of current had both been greatly reduced. Neil and Peggy(Early Out) were at the dock in Clarksville to greet us - and he made us a great dinner! The next morning, Carolyn Ann had again managed to trap a couple trees that tried to float by. Joe managed to push them free, but we still had to wait for the dense fog to lift before heading out. In spite of the late start, we managed to make it the 90+ miles back to Green Turtle Bay Marina on Lake Barkley. We'll pick up some mail and then move on to Kentucky Lake and the Tennessee River.